"I guess I'll wait until next year to move." "I don't want to mess with moving during the Holidays." "I have family in town for Thanksgiving, I can't possibly move then." "Who wants to spend Christmas or New Years unpacking a house?" Here's why your're wrong! Most buyers with this attitude are missing an amazing opportunity to get a deal on a home purchase. 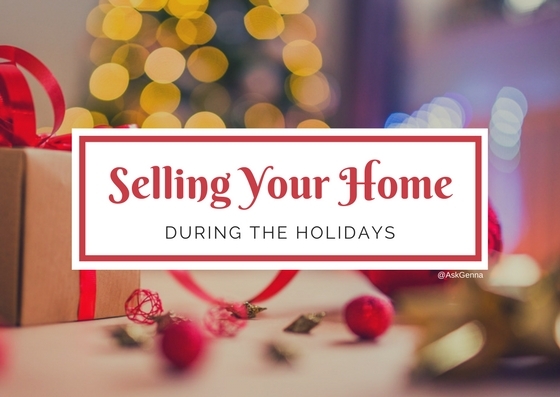 If a Seller is selling during the Holidays, it means they are very motivated to move. They're soaking up any potential opportunity to make a sale happen even during one of the most eventful (sometimes stressful) times of the year. Or, they may have been trying to sell for a few months. Sometimes they start their pricing too high, or may need repairs that they waited too long to complete. If the home is still sitting on the market around Thanksgiving, it means they'll be more likely to negotiate with you. "I don't want to move during ______ holiday." I'd like to introduce you to something called a Rent Back! When a buyer and seller agree, the Seller can actually rent the property back from the new owner to avoid having to move immediately after closing. You pay a pro-rated amount of rent to occupy the home AND still get to close on this fiscal year to get your great big tax rebate next year! "I don't want to show my house, I have family over!" First, most family will understand stepping out for a few minutes if you have your house on the market. If they don't, here's what you do: market the home under restricted, planned-in-advance showing times. It may reduce the amount of people who are able to view your home, extending the time it takes to sell, but it also allows you to plan in advance. "I like to decorate during the holidays." If anything, decorating for the holidays will enhance your home's appeal--as long as you don't go overboard. Feel free to put up lights, a tree, decorative holiday elements, etc. Just don't totally cover up features in your home that make it unique. And you absolutely get a pass on putting out family photos (I always recommend to keep it sparing or to one space if you can help it). I also hear from potential sellers who don't want to worry about decorating then packing it all back up to move. Remember--you can negotiate pre- or post-settlement occupancy with most homes during this time of year. That gives you extra time to pack as you normally would, or to get into a home before you close so you don't have to worry about decorating twice! I went holiday shopping already for my friends and family! I don't have any extra cash. Here's the part people typically don't know unless they have a conversation with a Mortgage Lender...you don't typically pay your first mortgage payment until 2 months after you purchase! For example, if you closed on a home in November, your first mortgage payment would not be until January! This is because you reimburse the seller for the amount of days unused (which they already paid for) in the month you close, then pay the first month at closing. This is just one small tidbit of knowledge that a Lender can help you with as you prepare to purchase a home! It's always important to have that conversation as early as possible in the purchase process to make sure that when you feel ready--you are actually ready to purchase. The bottom line is, for every objection there is usually a reasonable solution. The end of the year is no worse time to move (especially since we haven't had a snowy December in quite some time). The right time to move is when YOU decide to. The rest are just details that I can help you navigate. If you have any questions please feel free to reach out anytime!